The history of The Lambs ® extends back to early 19th Century England when a group of lively folk of theater and arts frequently visited their friends, Charles Lamb and his sister Mary, for dining salons discussing the arts. In the spring of 1869, thirty years after the death of Charles Lamb, a men’s theatrical and dining club was formed in London and named in their honor. Christmas week of 1874 a companion club was formed in New York by one of the London Lambs and its third Shepherd, English actor Henry J. Montague, who became our first Shepherd. The first meeting was at the original Delmonico’s Blue Room on 14th Street. (To see what 1874 was like, click here.) The Lambs incorporated in 1877 in the State of New York and its journey continues today. The motto of the Club is Floreant Agni — “May The Lambs Flourish” — which, with many ups and downs, the Club has done for more than 140 years. Changing times in the early 1970’s led to the sale of its landmark building on West 44th Street, now the Chatwal Hotel. Since then, the Fold has been pleasantly situated at 3 West. Originally restricted to gentlemen only, today’s club is attuned to modern sensibilities and has emerged and thrived as a society for both ladies and gentlemen. The roster of past and living Lambs reads like a Who’s’ Who and include: Fred Astaire, Gene Autry, Red Barber, Maurice Barrymore, and his sons John and Lionel, Ed Begley, David Belasco, Ralph Bellamy, Edgar Bergman, Irving Berlin, Joe E. Brown, Earl Carroll, Howard Chandler Christy, George M. Cohan, Cecil B. DeMille, Dwight David Eisenhower, Douglas Fairbanks, James Montgomery Flagg, Eddie Foy (Sr. & Jr.), Sir Cedric Hardwicke, William S. Hart, Victor Herbert, Ed Herlihy, Bert Lahr, Ring Lardner, Alan J. Lerner, Frederick Loewe, Alan Mowbray, Conrad Nagel, Elliot Nugent, Pat O’Brien, Will Rogers, Charlie Ruggles, Otis Skinner, John Philip Sousa, Fred Waring, David Warfield, Bert Wheeler and Hon. Robert Wagner. A searchable listing of past members is available by selecting the Membership Roster. The Lambs®, commonly known as The Lambs Club, is proud of its theatrical legacy, and of its continuing contributions to charitable causes which The Lambs Foundation administers and funds. J. Lester Wallack, an early Shepherd of The Lambs, was a leader in the founding of The Actors’ Fund of America; a close association between the Fund and The Lambs continues today. Numerous Lambs have served as Trustees of the Fund. Lambs were also instrumental in the founding of ASCAP, Screen Actors Guild and Actors’ Equity Association (see more below). A 1-hour presentation on the Brief History of The Lambs is available for societies, clubs and educational institutions with programs relevant to theater, music and the arts. To request more information about booking a no-fee presentation, click here. Upcoming presentations are pending for the Long Branch Historical Society of New Jersey, and the Bayside Historical Society of Queens, NY. A World War I transport ship was named in honor of The Lambs for its contribution to war relief. The USS Lambs was built in Kearny, NJ, and launched November 24, 1918. Later sold and renamed The Exporter, then resold and renamed The Winona. In 1945 it was loaned to the USSR and presumed lost at sea in 1977. Druing the 1920’s the Pullman Company had more than 9,000 cars operating on American railroads. At the time actors traveled exclusively by rails, and many Lambs’Gambols traveled the country by rail, raising money for the club. In 1929 Pullman manufactured a steel parlor car in Chicago and named it for The Lambs. It was equipped with 13 kitchen-parlor seats, 1 12-seat dinette, and a 16-seat lounge. I was altered but remained in service for decades. In 1945 Car No. 7007 was sold to the Pennsylvania Railroad and operated for another twenty years from Penn Station. The Lambs car was retired in the 1980’s. Today it is 455 miles from Times Square, on permanent exhibit at the Dennison Railroad Depot Museum in Dennison, Ohio. For a short while The Lambs Club car was available in an HO scale model, picture below. More than 90 years ago, Bill Finck, Sr., a cigar maker from Texas visiting New York, was brought ’round The Lambs by a friend. That night of Bill’s lived up to our reputation and a cigar was named in our honor. Hand-made in the Dominican Republic, the cigar is still sold today. Click on the cigar to order. If you are involved in theater, film, television, radio and music…if you are a performer (of any kind), an author, a playwright or screenwriter, a composer, a producer (et. al.) your life today has been affected by the actions of a Lamb. The Players – that certain club – was founded in 1888 by Edwin Booth, who was a frequent visitor at The Lambs. 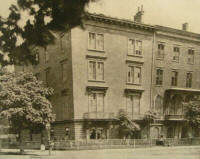 The Players’ brownstone was transformed into a clubhouse by Lamb Stanford White, who designed The Lambs’ clubhouse on 44th Street (1905-1975). Over the years The Lambs and The Players have shared an affectionate friendly rivalry, with members who belong to both clubs, and together we share the formation of Actors’ Equity: The Founders were Lambs who met in secret at The Players, for there were too many producer member wandering the halls at The Lambs who did not want the union to form. Founded in 1891 by Alice Fischer, wife of Lamb William Harcourt, and envisioned as a sister organization to The Lambs and The Players. The club name was suggested by Lamb Daniel Frohman. 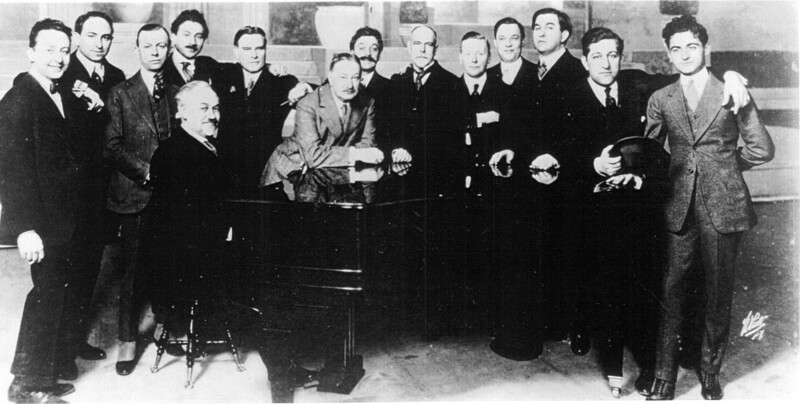 AEA was formed in 1913. The 13th Shepherd of The Lambs, William Cortleigh (son, William Jr. was also a Lamb), is credited with naming the new union. Of the twenty-one original Council members of Equity, twenty were Lambs. The three top officers elected were Lambs; Francis Wilson (President 1913-1920), Henry Miller (VP) and Bruce McRae (Corresponding Secretary). About the same time, a group formed to deal with growing concern of unionism in theater, calling themselves the Producing Managers’ Association (PMA). Of the forty or so members of the PMA, twenty-one were Lambs. The Actors strike of 1919 seriously divided The Lambs, with members who belonged to both AEA and PMA battling it out. The Lambs became a hotbed of union activity known as “Local One.” Lamb Augustus Thomas, who eventually became a Shepherd, is credited with bringing together the two warring sides which led to the end of the strike. Eight Lambs who served as presidents of Equity include Wilson, John Emerson (1920-1928), Ralph Morgan (1924), Frank Gilmore (1928-1937), Arthur Byron (1938-1940), Bert Lytell (1940-1964), Clarence Derwent (1946-1952), and Ralph Bellamy (1952-1964). Additionally Lambs who served a Executive Directors include Frank Gilmore (1918-1928), Paul Dullzell (1928-1948), and Willard Swire (Acting Exec 1980-1981). The concept of forming a society to protect composer’s rights began in 1914 at Shanley’s Restaurant at 43rd and Broadway. Lamb Victor Herbert was disturbed of how he, and others, were not receiving royalties for the performance of his work. Shortly thereafter, Herbert contacted fellow Lambs and copyright attorney, Nathan Burkan, and the process began. The Supreme Court’s decision (242 US 591: 611, e.d 516, Herbert vs. Shanley) set the stage, and ASCAP was founded in 1914 after many discussions in The Lambs’ Grille, six of the nine founding members were Lambs: Victor Herbert, Raymond Hubbell, Silvio Hein, Gustav Kerker, Glen McDonough and Nathan Burken. Of the 192 charter members, 35 were Lambs, among them were Jerome Kern, Oscar Hammerstein I, John Philip Sousa and Irving Berlin, with two Lambs becoming Presidents; Irving Berlin (1914-1918) and Henry Blossom (1917-1919). In 1919 Lambs Charlie Chaplin and Douglas Fairbanks, along with D. W. Griffith and Mary Pickford, founded an American film studio and called in United Artists. The idea originated with Fairbanks, Chaplin, Pickford and Lamb William S. Hart, but Hart bowed out before anything was formalized. When word got out, Richard Rowland, head of Metro Pictures, stated “The inmates are taking over the asylum.” UA’s first film, His Majesty, the American, written by and starring Fairbanks, was a success. 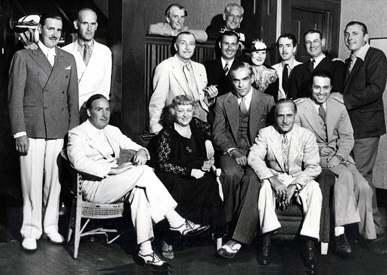 Of the 48 founding members of The Masquers’ club of Los Angeles (1925), 20 were Lambs. The were Roy Atwell, Hale Hamilton, Frank Currier, Alphonse Ethier, Bert Lytell, William Heppner, Bill Conklin, Lincoln Plummer, John Sainpolis, Robert Edeson, Frank Bond, Ned Sparks, Lou Payne, Robert Graves, Bill (W. K.) Cowan, Earler Fox, Frank Campo (Campeau), Bill Camp (William Carpenter Camp), Fred Esmelton, and Creighton Hale. The Lambs and Masquers continue a reciprocal relationship today. SAG was founded in 1933. Ten of the seventeen founding members were Lambs: Alan Mowbray, James Gleason, Boris Karloff, Ralph Morgan, Richard W. Tucker, Clay Clement, Morgan Wallace, Arthur Vinton, lvan Simpson, and Reginald Mason. Five Lambs have served SAG presidents; Ralph Morgan (1933, 1938-1940), James Cagney (1942-1944), Eddie Cantor (1933-1935), Leon Ames (1957-1958), and Ken Howard (2009-2012). 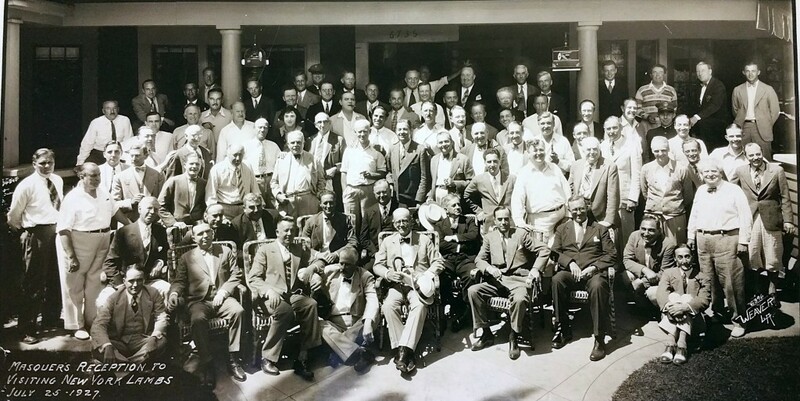 Below is a photo of fifteen of the original twenty-one directors and officers of SAG, ten of them were Lambs. Of the first 75 members, thirty-six were lambs. 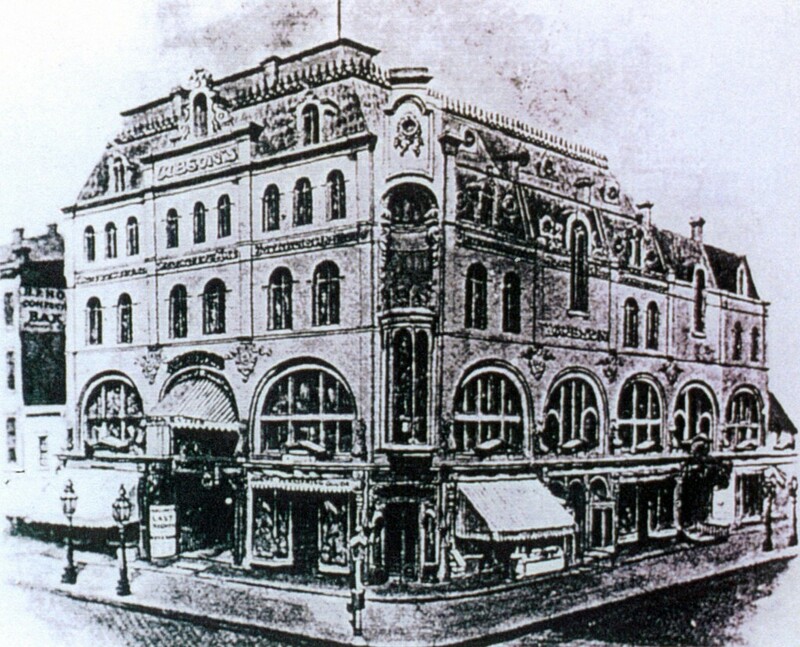 The meetings to form SAG were held in The Masquers’ club. The relationship continues today, where Shepherd Marc Baron serves on the union board, now called SAG-AFTRA, along with Lamb leslie Shreve; National SAG-AFTRA President Ken Howard was made an Honorary Lifetime Member in 2015. In 2012 AFTRA and SAG merged into the largest entertainment union in America, SAG-AFTRA, with over 165,000 members. Two Lambs, including its Shepherd, served on the boards of SAG and AFTRA, were part of the merger, and continue to serve on the board of the new union. In 1965 the international Laurel and Hardy appreciation society, The Sons of the Desert, was created. Its “founding tent,” or Oasis No. 1, began in The Lambs’ Grille, with the blessing of Stan Laurel. Among its founders and first members were Lambs: Al Kilgore, John McCabe and Frank Nastasi. Founded in 1912 as the Famous Players Film Company by Adolph Zukor, reportedly during lunches at The Lambs’ Grill room, along with Lambs Daniel Frohman and Charles Frohman. Charles Frohman joined The Lambs in 1897, and Daniel in 1926. Zukor joined The Lambs in 1914. Charles Frohman died on the Lusitania in 1915; and Jesse Lasky joined the company, and the Famous Players Film Company was renamed Paramount Pictures in 1916. Many films of Famous Players feature members of The Lambs.